Basketball 365 has got together with UIP and EMI Records for a brand new competition to mark the release of Paramount Pictures movie Coach Carter, which comes out in the UK and Ireland on 25th February 2005. The first five people, selected by the computer, who correctly answer the competition question will each receive a copy of the Coach Carter soundtrack, plus a Coach Carter T-Shirt, Beanie Hat and Whistle! Click here for your chance to enter the competition. Basketball 365 recently interviewed John Amaechi for a Q&A in our Interviews section, plus an upcoming feature about his home club and basketball centre in Manchester. In this exclusive competition, the first person selected by the computer, who correctly answered the competition question will receive a 2000-2001 Upper Deck trading card, personally signed by John. Click here to find out who the winner is. Basketball 365 once again teamed up with EA SPORTS BIG™ to give you the chance to win a copy of their latest games release Def Jam Vendetta, which is available now both in stores and online. The first five people, selected by the computer, who correctly answered the question will each receive a copy of Def Jam Vendetta for either the PS2 or Nintendo GameCube. Basketball 365 teamed up with EA SPORTS BIG™ to give you the chance to win a copy of their latest basketball games release NBA Street Vol. 2, which is now available both in stores and online. The first five people, selected by the computer, who correctly answered the question will each receive a copy of NBA Street Vol. 2 for either the PS2, Xbox or Nintendo GameCube. Basketball 365 teamed up with Twentieth Century Fox Home Entertainment to give you the chance to win a copy of their new DVD/video release Like Mike, which is now available in stores and online. 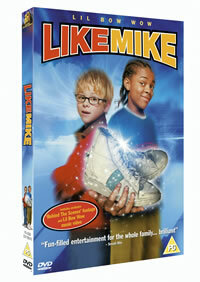 The first ten people, selected by the computer, who correctly answered the question will each receive a copy of Like Mike on video plus a Like Mike wristwatch! Basketball 365 teamed up with SEGA Sports and Infogrames Europe to give you the chance to win a copy of their latest basketball games release NBA 2K3, which is now available both in stores and online. The first five people, selected by the computer, who correctly answered the question will each receive a copy of NBA 2K3 for either the PS2, Xbox or Nintendo GameCube. The British basketball season comes to a close at The NIA in Birmingham on 3rd and 4th May, with Basketball Finals Weekend 2003. The world's best-known and most celebrated Basketball team - the Harlem Globetrotters, played in venues across the United Kingdom in April 2003. Basketball 365 teamed up with Sportserve, and we gave away one family ticket (4 seats) for each of the six UK venues on the Harlem Globetrotters European Tour. Click here to find out who the winners were. Basketball 365 and Revolver Entertainment gave you the chance to watch the world’s finest streetballers go head to head in this stunning piece of hip hop ballin’ action, with the release of Ballin' Outta Control. The first five people selected by the computer, who correctly answered the question, will each receive a copy of Ballin' Outta Control on their choice of either DVD or video. Basketball 365 and LEGO helped you re-create top NBA action with the ultimate NBA Challenge set. Featuring a full range of LEGO mini-figures, the players spring into action on a genuine NBA arena, complete authentic Spalding ball, sponsors logos and spectator benches. We had four sets (worth £39.99 each) to give away, and each week, for four weeks, the first person selected by the computer, who correctly answered the competition question won their very own LEGO NBA Challenge set. Basketball 365 and NASN gave you the chance to experience the culmination of the college basketball season for FREE! The first two people selected by the computer, who correctly answered the question, each receive a year's free subscription to NASN, with two runners-up also receiving a 6-month free subscription. Basketball 365 and Revolver Entertainment gave you the chance to experience streetball AND1 style, with the release of Ball Access: The Mixtape Tour. The first five people selected by the computer, who correctly answered the question each receive a copy of Ball Access on their choice of either DVD or video.